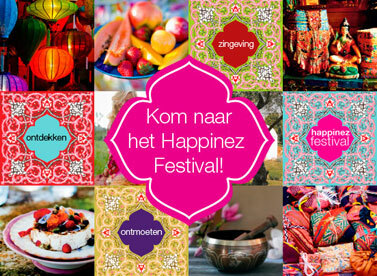 The Happinez Festival is the biggest spiritual festival in The Netherlands, organized by the Happinez Magazine, a very popular spiritual glossy. 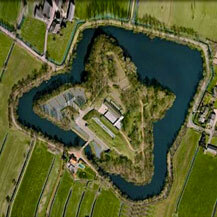 It is held every other year on the premises of the old Fortress Voorburg, near Utrecht. 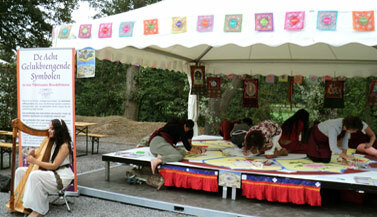 and meditative art; the reason why Tibetan Thangka Painting was asked for this performance on the festival. 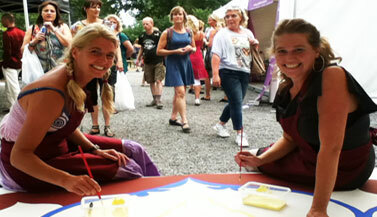 For this festival in 2013 Carmen Mensink developed a big painting project, where hundreds of visitors would participate in, over the course of two festivals. 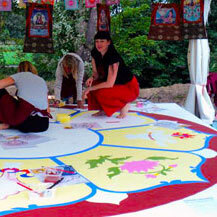 She designed a 4 x 4 meter (13.3 x 13.3 feet) large lotus flower, with 8 petals and in each of the leaf one of the Eight Auspicious Symbols; the most famous set of symbols in Tibetan Buddhism. 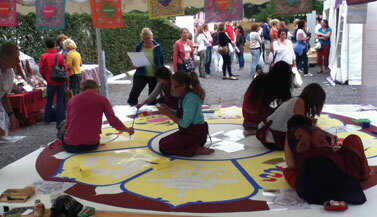 Everybody was welcome to join and help paint this wonderful mutual project: in three days, young and old, male and female, unexperienced and experienced, some painted just for five minutes or five hours even. With all the hands working together and all the positive energy and joy, a beautiful creation was made starting from scratch, as you can see in the following pictures. 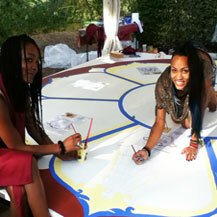 Together with her assistant Romeo she made all the preparations in the weeks before the event. 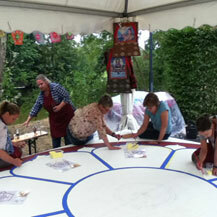 The painting has a total diameter width of 13.3 x 13.3 feet / 4×4 meters. 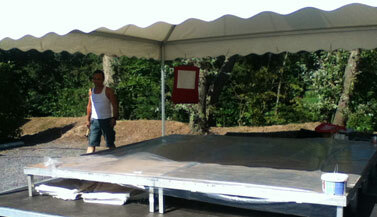 The day before the start of the event, Carmen and Romeo prepare the booth and the platform for the big painting, which takes them a whole day. 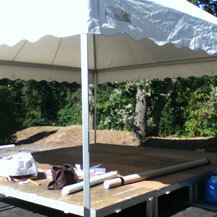 It’s very difficult to stretch the large piece of material that is constructed by 2 pieces of strong canvas, because the edges constantly curl up in the blazing heat that day. 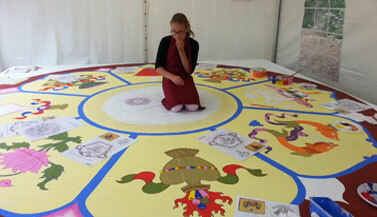 Carmen starts working on the basics on the first day of the festival: creating all basic lines, the circles (with handmade compasses) and the outlines of the lotus-shaped design with 8 petals (each petal contains one symbol). 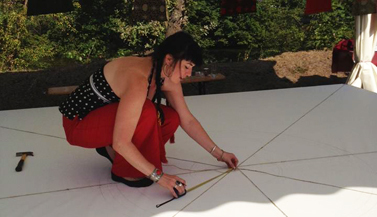 After that she moves onto sketching each of the Auspicious Symbols, while the first visitors start painting the borders of the canvas. 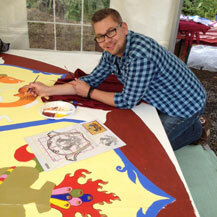 Traditionally when painting a thangka, you work from outside to inside. 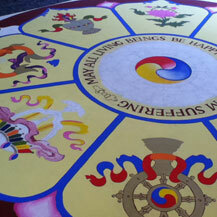 This is also done in this project of the Eight Tibetan Symbols as you can see in the pictures. The picture in the center shows more spontaneous musical visits: this beautiful harpist provides soothing background sounds while the visitors are painting the Buddhist Symbols. 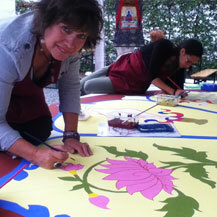 The drawing and painting of Tibetan art in itself is also very meditative,which you can experience for yourself when taking a thangka class with Carmen. 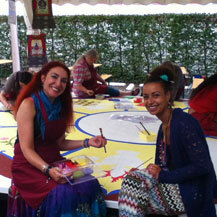 On the right she guides the visitors and explains about the meanings of the symbols they help to create. 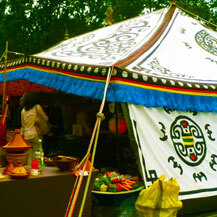 The photo in the center shows the great and cosy atmoshpere of the festival. 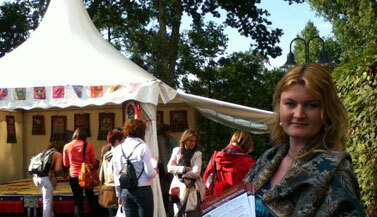 On the right a spontaneous visit of a musician who plays meditative bamboo flute music. 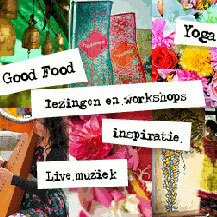 The event includes many elements that are all linked to spirituality: lectures, workshops, yoga, live music and meditation as well as meditative art: the reason why Carmen was asked for this festival performance. 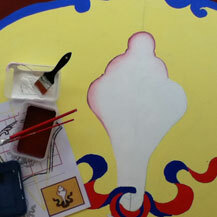 The picture on the left shows in the lower corner a glimpse of one of the grid-patterns (with the right measurents) that Carmen designed for this big thangka panting. 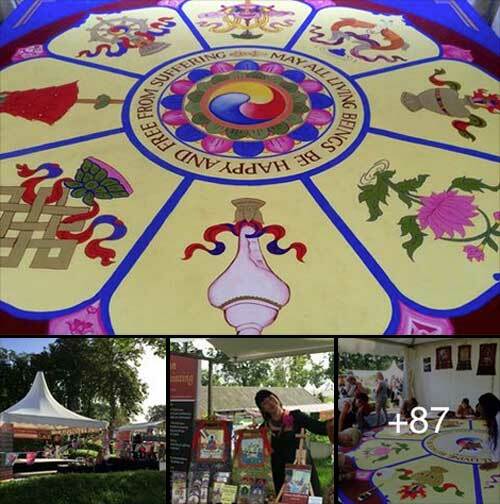 The photo in the center shows an overview of the booth with an explanation of the Eight Auspicious Symbols in Dutch. 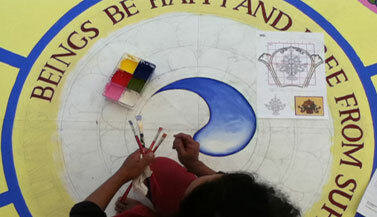 On the right a young woman fills in the space around a pencil sketch of one of the symbols. 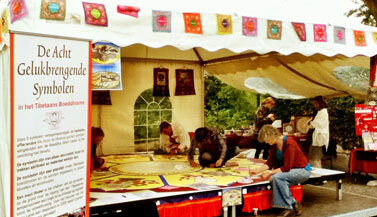 The 11yr old girl in the picture did not want to come at all to this festival her parents told us, but when she discovered the thangka painting booth she started to paint for many hours -and being completely absorbed in it- leaving her parents to wait for her till closing time. To Carmen and Romeo’s surprise the girl came back the next day and dragged her parents along! 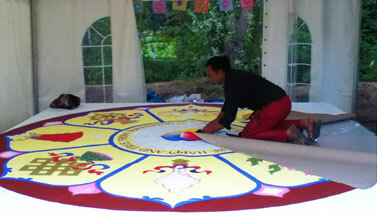 As she had shown great skill in detailed painting the day before, Carmen asked her if she wanted to start painting the mantra circle in the center. 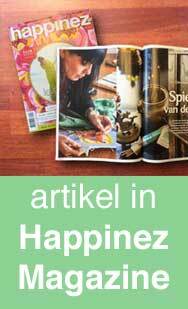 This image shows her right before she starts, and the first word she paints is the word HAPPY as you can see. Simply gorgeous! 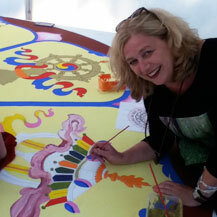 The beautiful lady on the right works on the Parasol (or Umbrella), a symbol for both protection and royalty. do substantially differ from each other. of ignorance, disharmony and other negativities in this world. 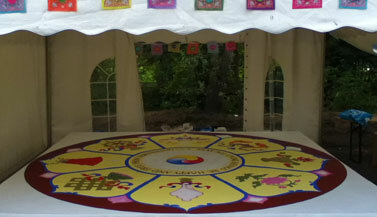 Behind the Parasol you can see a glimpse of the The eight-spoked Golden Wheel (or Dharma Wheel), which represents the ‘Noble Eightfold Path’: right view, right thought, right speech, right action, right livelyhood, right effort, right mindfullness and right concentration. 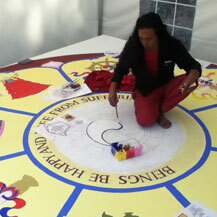 And as the wheel of the Dharma is being turned it awakens the Buddha potential present in all sentient beings. 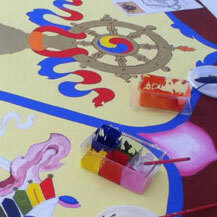 On the top of this page you’ll find a clearer picture of this buddhist wheel. 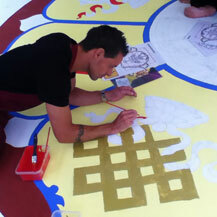 On the left the Endless Knot is decorated with gold paint. The Endless Knot (or Eternal Knot) has no beginning and no end. 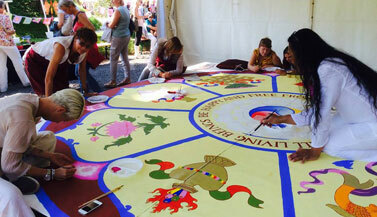 The lady on the right works on the soft pink gradation on the small white petals in between the big lotus petals. 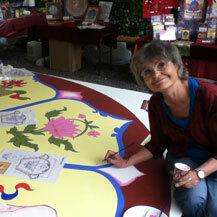 On the left a beautiful example of the outlining of the Lotus Flower. 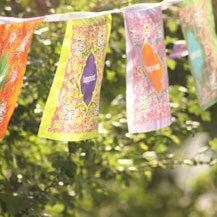 The Lotus, PADMA in Tibetan, symbolizes spiritual purity. The Lotus Flower always refers to many aspects of the path, as it grows from the mud (samsara), it appears clean on the surface (purification), and finally produces a beautiful flower (enlightenment). The bottom of the picture on the right shows part of the Treasure Vase with flaming jewels; which pours forth an endless nectar of long life, health, wealth, prosperity and other benefits in this worlds to those who follow the path of Dharma sincerely. feel and makes it stand out more. karma and disturbing emotions such as attachment and anger). 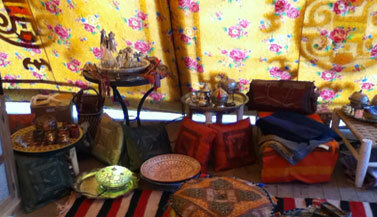 On the right: more groups of friends join and work on the project together with a lot of joy. 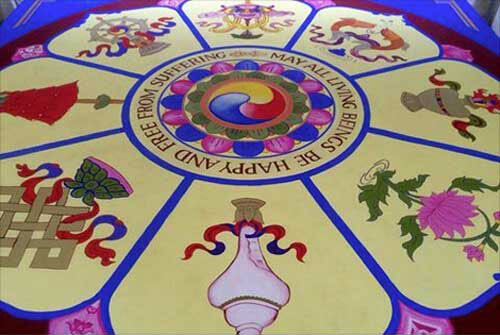 A 3 piece YinYang symbol is painted in the center (same as painted on the Tibetan Ritual Drum), representing The Three Jewels of Buddha, Dharma (teachings of the Buddha) and Sangha (the community of monks and nuns that passes on the buddhist teachings). 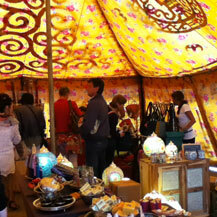 On the right one of the beautifully decorated Tibetan tents at the festival. Carmen loves this blessing so much because it shows so clearly what Buddhism stands for: the recognition that all sentient beings –including all animals, even the smallest insect– want exactly the same thing. 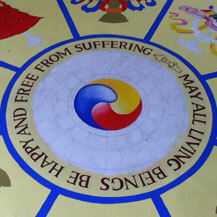 All beings simply want to be happy and not suffer. When we truly realize this it makes us more mindful and inspires us not to hurt other beings in any way. 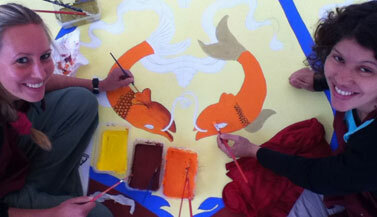 On the left a father watching his daughters paint the fins of the pair of fishes. 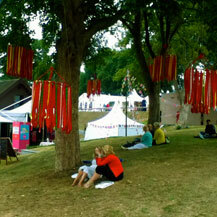 The picture in the center was taken at the end of the first festival in 2013, after all visitors had left. On the right -after many days of little sleep but lots of joy- Carmen overlooks the project coming into existence, with delight and satisfaction. 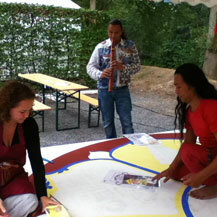 After the end of the festival Carmen and Romeo carefully unstretch the painting again, roll up the canvas and clean up the festival booth. As it is such a large painting it was not finished that first festival and still needed more painting, shading, outlining and an overall finishing touch before it’s done. 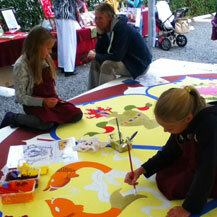 At the subsequent festival in 2015 the work on the painting was continued and finished! 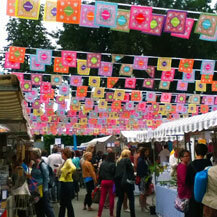 At the Happinez Festival in 2017 the artwork was exhibited. 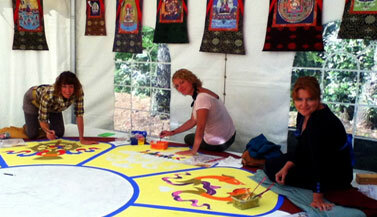 Do you want to learn how to paint or draw the Eight Tibetan Buddhist Symbols? 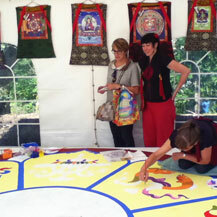 Carmen regularly offers classes on drawing & painting the Eight Tibetan Buddhist Symbols and you can Subscribe to our Newsletter to stay informed on future classes and projects like these.